Skytopia : Music theory and art aesthetics. Can melody be rated? Is there such a thing as perfect taste in music? This article will attempt to explain my belief how every piece of music, every sound, and every picture can be rated on its own merits outside (as well as inside) human opinion. Introduction Aesthetics of music theory Mathematical formula for best music? A perfect melody or chord sequence? Why do people disagree on music? What's the best style of music? Why is one piece of music better than another? How complex would a possible formula be? Are intricate tunes better than simple ones? Further comments, thoughts and possibilities Aesthetics of Art - pictures and graphics A maths formula or program for graphics? 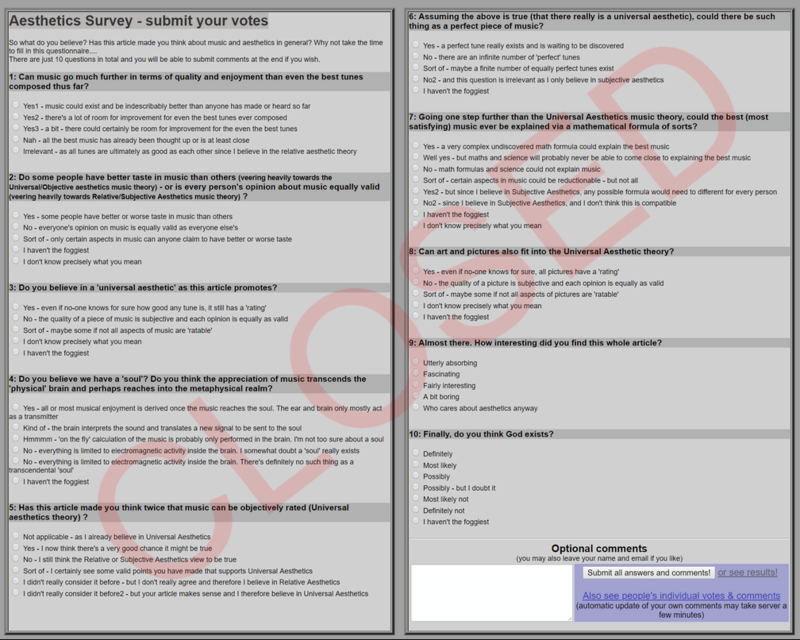 Take part in the Aesthetics survey near the end of this page. I'm not exactly sure of the general consensus, but I have often heard the opinion that with music for example: "There can be no final, or definitive judgement" or that "One person's subjective opinion is just as valid as another - and that it's only a matter of personal preference". In other words, many believe that music is only good because our minds are individually (and in different ways) - 'programmed' or 'geared' (for whatever reasons) to enjoy it from their perspective. This is called the "Subjective or Relative Aesthetics View"
Well, no doubt people's 'taste' is biased (to varying degrees) due to a number of reasons:- what they're 'used to' hearing, 'cultural trend', simply their quality of taste in music, or even 'nostalgia' (though obviously a tune could still be nostalgic to someone and good). But if as I think, music is ultimately objective - this would mean that even if we didn't exist, every infinite possibility in music has a degree of quality to it (whether good or bad), which would make it stand up in its own right. In other words, every picture or piece of music contains an inherent (mathematical?) 'goodness' intrinsic to that design. In the same way, all graphics and artwork can be given a definitive aesthetic evaluation - and that even if no-one knows for sure how good it /really/ is - that doesn't mean to say this 'judgement score' doesn't exist. Theoretically then, the better one's taste in music - generally - the closer one would agree with this 'Universal Aesthetic' or 'Universal Musical Evaluation' (UME). For the sake of argument, I'm going to focus on music with a mini-section on what makes the best graphics/pictures near the end of this article. "Surely it's too simple to give a piece of music one score?" Well, it's possible, but incomplete to give just one ('average') score to a piece of music, so perhaps more appropriately, 3-5 (maybe more!) scores judging the: melody/harmony, melodic/harmonic structure, rhythm/intricacy, time duration/structure and timbre (the lowest 'level' of sound/music) would be ideal. 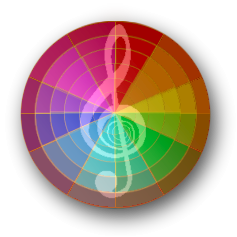 All these aspects of music are very much interwoven which is why it gets so confusing, but I believe they can all be rated - with the very best music containing high scores for all of these attributes. Of course, each 'whole' piece of music is greater than the 'sum of its parts', but no doubt if you were to break a tune down - every single chord, 'sub-melody' or 'bit' of that tune could be rated and evaluated on all the aforementioned attributes - too. One important point is that one tune can still be better than another, but with the /overall/ worse tune containing something the better one hasn't got - thus it isn't a worthless piece of music compared to the 'better' one. I should imagine this applies especially to the chords or melody of a piece (as opposed to the orchestration/structure). "But if music could be given a definitive rating/s, surely there would also be a mathematical/programmable formula to make the best music?" "Is there such thing as a perfect..... melody or chord sequence?" Maybe. Or maybe there are a dimension of perfect melodies. I only know that for every good melody/harmony that could exist, there are thousands/millions of potentially bad melodies. What's amazing is how a tune's quality can be good in so many different ways - each 'style' with its own impact on the emotions. There's probably a vast multi-dimensional hierarchy to chord sequences for example. The best chord combinations are at the top - all unique, brilliant and varied. Orange is a 'nice' normal chord/change. ' "Deep" orange' is the same kind of 'ordinary' chord change - but well implemented. 'Shallow' orange is the same chord/change but not done so well. 'Strawberry' - this is more unusual than orange and more fun to listen to. 'Lemon' - A 'sour' chord/change - great for 'tense' climatic moments in tunes. 'Apple' - for the chord changes which don't need to sound good in themselves, but are necessary to blend well with the rest. Tunes generally have lots of these. 'Lime' - A cross between the 'tense' mysterious-ness of Lemon, and the cool Strawberry chord. (All of these would be the 'Deep' (as opposed to Shallow) versions for the best tunes by the way). So for example, "Shallow Lemon" is a 'tense' chord change that's more of a whimper. But 'Rich' (even stronger than 'Deep'!) Strawberry is something to really look forward to! "Why does someone think that tune X is better than tune Y, and someone else think the reverse?" Incidentally, throughout this text, when I refer to music that's 'better', I also mean that it's more fun, 'atmospheric', enjoyable, perhaps exciting - and ultimately more rewarding to listen to. If people don't find the best music to be enjoyable, perhaps they are 'missing out' and lack discernment (in one way or another, to varying degrees and for whatever reasons) in melody, rhythm and certain chord patterns. Without any 'All-Time Super Formula', possibly the best way of finding out who's right, is to apply the 'Test of Time' theory. This asserts that a piece of art is intrinsically good if held in high regard throughout the ages - rather than just 'what's in fashion' at the time. I would guess that it's certainly a more valid approach as it removes (most) cultural bias, but nevertheless - not a definitive judgement - as there are other factors in people's taste which distort what's good or bad about music. "So what's the best style of music?" Most 'Styles' (if done well) can contain the all important aspects of what makes music good - melody and structure. Obviously, some 'styles' are biased against melody/harmony and other styles are biased against rhythmic variety, so those styles aren't so good (....the best music combines both). a: The cultural habit to imitate what already has been done. b: The limitations and advantages of certain instruments (e.g. orchestral) and techniques. All of these combine to form a collection of recognisable 'quirks' in a piece of music - thus enabling us to see which 'style' it is. But because music is effectively just a combination of motifs, patterns and harmonies put together, a more thorough break-down is desired. For example, music in the style of 'rag-time' is better described by saying how the end of each 'section' (of which there are usually many) usually ends on the 'tonic' chord (C major if the key of the piece is in C major) and how the bass-line alternates between a single note and a 3 or 4 note chord). These are simple mathematical patterns/traits of which /every/ piece of music has a certain degree of. "How can you be so sure that one piece of music is better than another?" In my opinion, there's a wealth of positive evidence, but here's one simple example; If one single chord could be better than another chord, then the same reasoning would apply to a whole string of chords - and ultimately to a whole tune. Naturally, a chord that sounds bad in one piece could fit very well into another tune, but there surely comes a point when a chord is so bad that it becomes practically impossible to fit into any tune. D, F#, B, Eb, F, C.
Hmmm... that was harder than coming up with a /good/ chord ;-) Actually, it's my guess that these two chords could possibly fit into a tune by playing briefly, or as part of a more underlying chord, but I wouldn't go as far to say the 6 note chords mentioned earlier could do this. C#, F#, B, Eb, F#, Bb ? ....with the overall point being - if maths can explain what's good and bad about the 2 simple static chords as shown above (which by the way, people have tried to do, and to some point have succeeded a little - there are whole books on it! ), then it could also explain /a sequence/ of chords, eventually going on to explain a melody, and how this melody interacts with the accompanying chords and how /this/ interacts with rhythm etc. etc. And how /all these/ aspects interact with the 'sub-atomic' world of micro-second music (i.e. the timbre/pitch of the instruments/sounds etc.). It's very, very complex, which is why no formula currently exists. Amazing also how despite this 'behind the scenes' complexity, how music can reach our emotions and affect us all on such a fundamental level. "If a formula did exist for creating the best music, how complex would it be?" Take chess. One could get a computer to analyse a particular position for the best possible move/s. There isn't any 'easy' formula - it has to laboriously go through every single possible move branch to see which is the best possible continuation, so it's (more or less) effectively doing what a human does, but faster. Now music, is a million times more complex than this - because each new section that is 'calculated' (if such a thing could be done), would have to be cross-checked with every part of the tune that has just gone by. Any possible program to create good music would probably be made up of many sub formulas (one dedicated to the melody, one for the harmony, rhythm etc. etc.) - each eventually combining and 'growing' music in some way to create the final piece. I believe if you start off with even a slightly different 'seed' of music, the best possible continuation would continue vastly different and unexpectedly. a) Music with timbre based around the harmonic series, where the best timbres tend to contain 'clusters' of harmonics, and 'evolving' harmonics. If you look at the spectroscopic analysis of a sound in say... Cool Edit Pro, you'll find the best instruments or sounds have 'nicer looking' and more 'logical' patterns. Yes, I know. This just pushes the problem further out, but it's the best I can do for now. b) Music based around a scale of 12 equal spaced notes to the octave (for the underlying harmony and melody). c) Chord sequences that are good. This is hard to define or pin down, but it's somehow related to the tonal 'hierarchy'. The human soul knows when a chord sounds good, and authors have written whole books on the subject, but we're still far away from explaining it all! d) Chords and melodies approaching 'atonal' could break up some sections and chord sequences for contrast, but generally the best music will be 'more or less' tonal in my opinion. Similiarly, a good dose of musical dissonance is a good thing, as long as it's carefully balanced out with the degree of consonance. e) In good music, a small section taken from the whole is amazing too (for example, zooming into a picture would reveal a new and 'different' picture; and that as part of the whole, it still fits in appropriately). Also, slowing a tune down with a significant amount of (fast playing) detail will often still provide a pleasurable listening experience. f) Related to the above, fractal-like patterns to the tune are essential. A good example is the beat, where a relatively faint hi-hat will sound every beat, but more prominent percussion (such as a snare, or bass-drum) will sound every 2 or 4 beats. A nice big 'smash' could sound every 16 beats. This example is only a very limited view of the whole picture of course. Generally speaking, structures and (some) consistent patterns are vital. Also see I and L.
g) Rich and numerous layers of contrapuntal melody, but perhaps with more 'solo-esque' textures elsewhere in the tune for contrast (for example, at the beginning, so as to allow for a feeling of crescendo). Two, three, or more simultaneous melody lines (polyphony) will add tremendously if done well. h) Melodies or chords that smoothly flow from note to note via semi or whole tones, with relatively few 'big' jumps. These would tend to fit in with the underlying or implied chord at that point in the tune. Broken chords (for example in Moonlight Sonata) might count as seperate melody lines, so that would explain the constant 'big jumps'. I know, quite vague - your mileage may vary. i) Hooks and motifs are paramount. A hook or motif is a 'piece' of melody, perhaps a bar or two, which recurs (or 'echoes' upon itself), afterwards in the very same bar, or perhaps later in the tune. Or it might repeat later on, but in subtlely different ways (with for a example, a note higher or lower) - so as to fit into the new chord/key structure. Also see F.
k) The cadences of excellent melodies usually have 'something' about them. For example, a crescendo, richening of the chord/s, effect (such as a bass/melody slide), drum 'fill-in', melody 'embellishment', a new temporary instrument etc. etc. l) A 'beat'. It doesn't necessarily have to be a snare/drum/hi-hat beat, but whatever it takes to keep the tempo each bar. A more general description would be a quick-changing dynamic-volume sound effect. But I have heard 'beats' (or more like 'sounds') which can last the duration of the bar and still sound effective. Also see F.
n) Tailored timbre according to each note (something virtually no music has to any significant degree). Anyway, assuming the best sounds, chord sequences, and rhythms could also be calculated (other variables/dimensions adding to the confusion), these would also have to be cross-checked with the tunes' history - because unlike a chess game (where the previous moves/positions don't matter any more), every part of a piece of music is inextricably linked with every other part. The mind (sub)consciously picks this up 'on the fly' when listening to music - and it's part of what makes it so amazing. Are intricate/complex tunes better than simple ones? Difficult question. First off, I'm defining 'simple' as a tune which is unadventurous in its use of chords and/or rhythms. The short answer is yes. The long answer is tricky because there could be many simple tunes that are 'perfect' to a limited extent. To put it another way, a perfectly formed 'simple' tune still has something the perfect 'complex' tune doesn't have, but with the complex tune obviously being better overall (naturally, if the complex tune has too many flaws, this might be enough to make it inferior to the simple tune anyway). The best analogy I can think of is comparing the simplicity of a sphere to the complexity of a beautifully intricate design (made up of many shapes). The intricate design is better overall, but it still lacks something that the simple (light sourced) sphere has got. And then if this intricate design were to be distorted so that randomness and illogical shape crept in, this might well be enough to make the simple sphere better in both senses. One other point to bear in mind is that the more complex one tries to make a tune, the more likely errors (either in the melody or orchestration) are going to creep in. At the moment, only people can really create decent melodies - and I suspect it will stay that way for a long time to come. But imagine some kind of 'super-brain' or future super-computer - the music equivalent of the chess program 'Deep Blue' - only much better. One could ask it all sorts of questions such as: What's the best possible melody for a 6 note tune? ...or a 60 note tune? ......or either of these with say.... 2, 4 or 10 simultaneous melodies (contrapuntal melody or 'counterpoint'). Imagine how exciting that would be - finding the incredible results that this supreme formula would produce! ...Seeing what piece/s of music would fit best to a certain rhythm - say... 6/8 time. ...Restricting the formula so that certain notes couldn't be played, or that the tune always had to be in harmony with a particular note - and see what the best tune would sound like then. ...Limiting the length of each note so that no one note lasts longer than a quarter of a second. No doubt a very intricate staccato styled tune would result. All of these would probably make the tune 'averagely worse' in some way, but it would be of great interest to hear the interesting 'styles' and 'musical surprises' that would come from these 'filtering' techniques. What of graphics, pictures, artwork and moving pictures?" e: luminous, translucent and subtle colours. g: '3D' scenario, so that there's a combination of big and 'small' objects. This last one is interesting. It assumes that the best pictures contain simple (foreground) and complex (background) designs (...of course, the 'simple' foreground could still be subtly complex by the way). 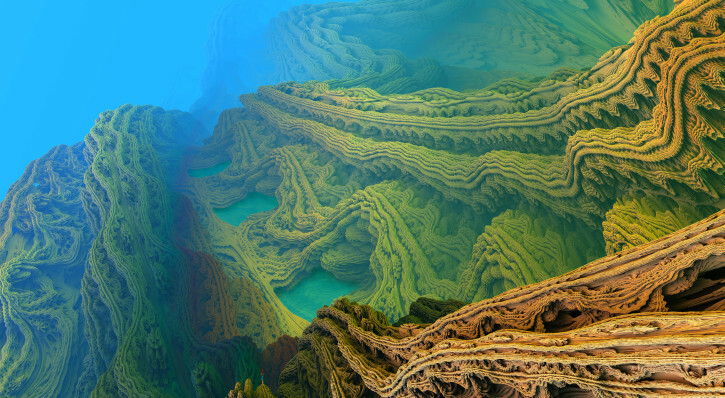 In fact, it's closely related to the 'fractal' aspect. How should one go about the huge task of 'rating' a picture though? What criteria would be involved and what are the 'elements' of the picture? You might want to visit my Rating Art page. This was specially done for a web site forum I frequent, but its principles would apply universally. One important point is that any implied meaning behind a picture is a separate aspect from the actual design (shapes/lines/contours/colours) of the picture. This isn't to say that the meaning or 'story' or 'expression' behind doesn't add something, but one could equate it to adding lyrics to music, or background music to a TV film - or even pleasant smells to a shop (i.e. effectively multimedia). Just like with music, the most intricate and ultimately beautiful artistic designs do not have to rely on apparent 'meaning' to justify their beauty. If a static picture wasn't complex enough to determine its quality - how about an animation? I believe music and art are so complex and wonderful that we'll never find a 'magic formula' for creating the best of either, but maybe we'll edge closer. This doesn't mean an (undiscovered) formula doesn't exist which couldn't do this of course. And no doubt, I believe there's a whole range of 'best tunes' or 'best pictures' that are utterly different from each other, all of which are unique and amazing, and where the 'magic formula' possibly explains them all. I imagine any possible 'formula' to create the best music/art would need to contain numerous concepts or sub-formulas working in conjunction. This is similar to the solving of Fermat's last theorem, where the combination of known mathematical concepts and entirely new ideas were put together to finally solve the problem. If there is one thing that I have found in common with the best pictures and music, it's that a small section taken from the whole is amazing too (for example, zooming into a picture would reveal a new and 'different' picture; and that as part of the whole, it still fits in appropriately). I hope you have enjoyed reading this article as much as I have enjoyed writing it. Please email your thoughts on this text - I'd love to hear from you! Alternatively, message your comments and stir up some debate on the Skytopia Forum. Thank you to everyone who took part in this poll and left interesting feedback over the years! This poll is now closed, but you can see the results here. Also see the valuable individual choices and feedback for the poll here. Plato, (Savile) Kant, Thomist, Thomas Reid, aestheticism, objective, subjective, relativism, cultural relativism, modernism, post-modernism, modernism, postmodernism, modernist, postmodernist, contextualism, subjectivism, beauty, aesthetic/s, test of time theory, intrinsic value, intrinsically good, pure aesthetic/s, relative aesthetics, universal aesthetic/s, absolute music, program music, definitive, absolute, aesthetic attitude, definition, quantify, quantitative, criteria, judgement, taste in music, transcendental language, music is the universal language, beauty is in the eye of the beholder, 'elitist', qualitative judgment, purely subjective, empirical evidence, music psychology, musicology, empirical musicology, quantitative musicology, universal musicology, grand unified theory of music, autonomy. symmetry, transcend, transcendental, atmosphere, haunting, best, amazing, emotion, evaluate, evaluation, mathematical, formula, perfect taste in music, timeless, rhythm, melody, melodic, intricate, complex, hierarchy, complex music, meaningful, intricacy, imagination, creative, sublime, esthetic, exhilarating, profound, orchestration, intricate melody, woven melody, counterpoint, catchy, objectivist, visionary, idealism, idealistic, analysis, analysis of, classic, classical music, Bach, Beethoven, Mozart, Chopin, charts, more than just nostalgia, video game music, multiple melodies, strawberry chord/s, dream chord/s, simultaneous melody, simultaneous melodies, zoom in, fusion, hierarchical, hierarchy, contrapuntal, full spectrum of sound, philosophy, contingent, patterns of sound, patterns in music, 70s, 80s music, eighties, 80's, old school, old skool, classical, discord, concord, building up, climax, last cadence, final cadence, 4th cadence, tension, cascade, cascade of notes, subtle, dynamic, fractal, harmony, connoisseur, standing the test of time, stands the test of time, makes a good melody. Greatest Classical Music - A sub-page dedicated to rating and reviewing classical music. Greatest Pop Music - - - As above, but the cream of pop music. World's most unanswered music questions - - - As it says on the tin. Find out the most profound questions in music theory. The 12 golden notes - - - Why are there twelve notes in the musical scale? Rating art - - - My own criteria for rating art. Waterfall views - - - The Skytopia art gallery. Denis Dutton speaks on universal aesthetics - A small, but concise text supporting universal aesthetics, and how a sample of art objects will always have cross-cultural appeal throughout the ages. "What makes 'Good Music' good?" - An excellent article by Mickie Willis. Also see his "Why Do So Many Smart People Listen to Such Terrible Music?" article. Statement to Music Majors - While I may not agree with everything, this controversial page by Jody Nagel neatly sums up most of the constraints imposed upon modern chart/pop music. Breaking the Sound Barrier - John Winsor presents evidence for universal aesthetics in this thought provoking book. Enchanted Ear - The Brain and Music - An article about how the brain processes music. By the looks of it, the answer to question 4 in my aesthetics survey is at most: "Kind of - the brain interprets the sound and translates (or filters?) a new signal to be sent to the soul". A lot more happens in the brain than one might initially think.